The overall flavor of the song is very reminiscent of LRB, of course, as well as many of my other 70's vocal pop faves, like Orleans, Ambrosia, Atlanta Rhythm Section, Poco. Perhaps the BeeGees on the right day. And the song bears an almost illegal resemblance to the Hall and Oates hit "She's Gone," but that's a whole 'nother Oprah. Soft rock, some might call it. Real ear candy for me, I can't get enough of it. So now let's hop on the trivia bus and figure out who these guys were, and why I thought it was Little River Band. According to the Player Greatest Hits CD insert and a few sundry websites, Peter Beckett of the fertile town of Liverpool came over to the states and met Galveston-born JC Crowley at a party in LA in 1977. Story has it Beckett saw Crowley and figured he must be a musician, since he was the only other one in jeans where everyone else at the party was in the then-trendy all white outfit. They later jammed, formed a band, and quickly cranked out the tune in question, which would be their greatest hit by far. The band included John Friesden on drums, Wayne Cook on keys, and Ronn Moss on bass. Here's where it gets a little weird. Band personnel come and go, that's not weird, but later Beckett went on to join Little River Band. Mystery solved there. But you'll never freakin guess where Ronn Moss ended up. Or maybe you have already guessed by recognizing on of the dudes in the picture. 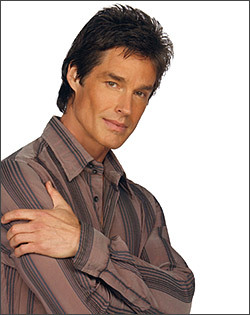 I wish I could draw out the suspense a little longer, but I know your eyes have already darted over to the second picture in this post, yes, you guessed it, it's Ridge Forrester from The Bold and the Beautiful! It's like Jack Wagner all over again! music than "I need a drink and a quick decision?" I think not. I agree, it's a killer lyric from a killer song.